This membership category is for practitioners that have at least five years experience in the microfinance industry. The practitioners must hold a middle management position with a microfinance institution, or a non governmental organisation that provides financial services. 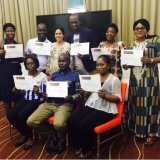 Graduates of the professional certification programme in microfinance can also apply to be an Associate of the Microfinance Association if they have 12 months experience within a microcredit organisation.